Embrace the ocean in a robust way with the big shackle. €5,00 donation Plastic Soup Foundation. Cool black shackle forged from the finest stainless steel. Signature blue pin showing our support to the oceans. With the MBRC The Ocean logo engraved. Wear it with pride and share our story. 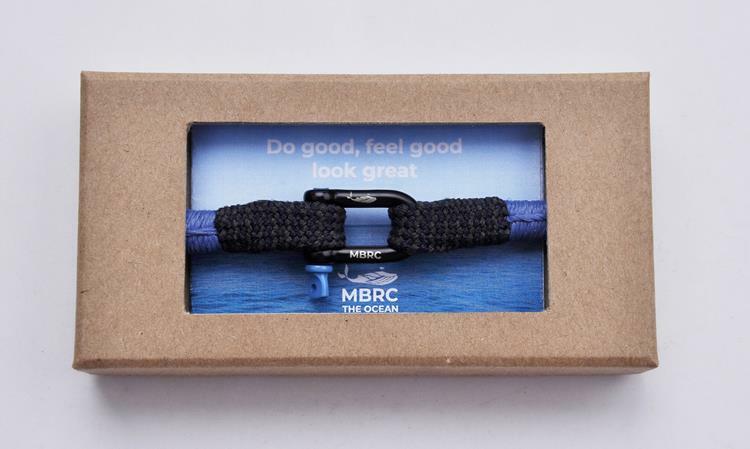 The rope colour combines navy blue with charcoal grey. All our ropes are made from ECONYL® 100% regenerated nylon waste like old fishing nets. Our ropes are made in one of the oldest rope factories (est. 1628) in the Netherlands. With this model you can shower & swim. To keep your MBRC at its best you can wash it in the washingmachine, please remove shackle before washing.